My six year old son likes to read. He just happens to prefer to do most anything else to occupy his time. If left to his own devices, he would spend his day watching TV and drawing. In an attempt to add some balance to our summer schedule, I found this article by my dear friend Christina with a link to howdoesshe's reading bingo. 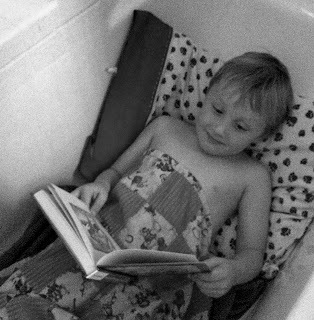 He excitedly picked the bath tub for his first 30 minute reading adventure. When the timer ended, he ran to his bedroom as he shouted, "Now I'm going to read in my pajamas!" We are off to a good start!